When I was still a schoolboy I found Daniel Jones’s Outline of English Phonetics in the local public library and devoured it with great interest and excitement. It all made perfect sense to me, with one exception. That concerned the English r sound. I couldn’t square Daniel Jones’s description with what I could feel myself doing when I pronounced this consonant. Obviously I was not using a “rolled” r (trill) or a “flapped” ɾ (tap). And I wasn’t making any kind of uvular sound. 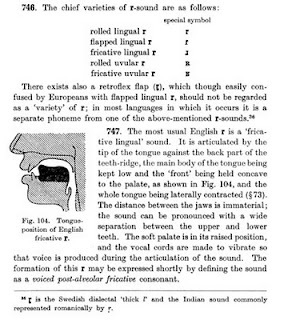 So I must be using the “most usual English r”, the “fricative lingual sound” ɹ (which we would today call a postalveolar approximant). But I didn’t seem to be articulating it with the tip of my tongue so much as with the body. And the combinations kr (as in crown) and ɡr (as in green seemed to have some sort of affricated pronunciation. My puzzlement was resolved only several years later when John Trim explained to me that I use a “molar r”. The strange thing is that it doesn’t sound any different from the postalveolar r sounds that other people use. People don’t react by saying “that’s a funny kind of r”. The VASTA listserv has been having a discussion about “bunched r” recently (another name for the same thing), and I said I would write something about it here. is drawn back into the pharynx just above the larynx. The second modification is a fairly deep depression in the surface of the tongue opposite the uvular zone. This sub-uvular concavity can be acquired as follows. Produce a uvular trill. Note that in order to do this you have to form a longitudinal furrow in the tongue within which the uvula vibrates. Now move the whole body of the tongue slightly forward, while retaining precisely that deeply furrowed configuration. The result should be a close approximation to the typical American ‘bird vowel’, for which the phonetic symbols [ɜ˞] and [ə˞] have been used — both representing a central vowel with an r-like modification. As we saw, this very strange American vowel involves not only a concavity — or ‘sulcalization’ (from the Latin sulcus `a furrow, or trench') — of the tongue in the neighborhood of the uvula, but also some slight degree of pharyngalization. It is because of this that a series of vowel-sounds with modification of this rhotacized type in some languages spoken in the Caucasus area of Russia, notably Tsakhur and Udi, are known as ‘pharyngalized’ vowels. Like Erik Singer, who found this quote from Catford, I'm not sure I agree with the claim of pharyngalization. It can be there, no doubt, but I don’t think it's a necessary accompaniment. My own r is consonantal, of course, while the American vowel is syllabic (a vowel). But the articulation used appears to be the same. In my experience, when someone has claimed that there is an audible difference between the molar and the postalveolar kinds, I find that there is also some kind of difference in secondary articulations (pharyngalization, labialization etc), but no audible difference when this is stripped out. That’s why I have some sympathy with the argument that if we can’t hear the difference we don’t need a special IPA symbol for the molar r. It will be sufficient to symbolize the secondary articulation(s), e.g. ɹʕ or ɚˁ. I very much agree that we need a symbol for the “bunched,” “braced,” or “molar” /r/. If it has to go in the set of IPA extensions for disordered speech, so be it. At least we’ll have a symbol. I wonder, though, should there be separate symbols for the vowel and consonant? It’s really a single physical action (varying only, I think, in the degree of the bracing), and according to the rules of the IPA, there should therefore be only one symbol corresponding to it. […] There simply must be a unique symbol. This is my awkwardly bitmapped attempt to create a symbol that takes the turned-r and adds a another wing to it, stretching out to the right. We can recognize this as r-ish, but it is sufficiently different from the alveolar-approximant symbol to avoid confusion with that placement. This symbol could also be modified to specify degree of bracing, with one or two additional “wings” stretching to the right, at mid-level and at the top. It is not impossible to make a "lighter" sound with this placement —though it becomes a bit more of a mid-tongue bunching rather than the hard retraction of Oklahoma. Can people actually hear a difference based purely on place of articulation? Or is there always something else involved? Let’s have some sound files. We can't really attach sound files here, can we? No, you have to put them somewhere else and link to them. I don't think I'd necessarily hear a difference when the bunched r is used as a consonant. It's the bunched r as vowel that I can hear. The bunching necessarily changes the resonance, so the vowel sound is affected. I've been trying to figure out whether I ever bunch r in my own everyday speech. I think I may bunch in kr and gr, but I'm not at all sure I do it consistently. As for NURSE, if I bunch (which I think I do, but not all the time) I don't retract all the way, as in the Oklahoma/Texas version, which I hear in other parts of the south as well. I'm certain that I don't bunch in r-colored diphthongs, in which I include START and NORTH/FORCE as well as NEAR, SQUARE, CURE. In all of these, and also in LETTER, I do curl my tongue tip up, if not back. I would describe my r, both as consonant and vowel, as apical-post-alveolar, slightly retroflexed. Bunching, at least full-retraction bunching, affects the resonance of the vowel r, so it is pretty easy to hear a difference. Here is a sound file of me reading Comma Gets a Cure. You can hear that my microphone technique is poor, as there is a high level of pop on my plosives, and a lot of hiss on my s. I've edited out distracting mouth noise between utterances, but otherwise I've left it alone. Compare with Oklahoma Seven on IDEA, White male, born 1949 Amarillo, Texas. There are, of course, other differences in our accents, but I think the difference in r is very clear in vowel r, and occasionally in consonant r.
John Laver (1994) suggested the Greek psi-symbol for bunched-r; no reason given, I guess simply because it was a spare symbol. @Anonymous: Now I'm intrigued. Why do you think Erik's proposed symbol would be difficult to write? Isn't it just a question of developing muscle memory through practice? Speaking for myself, I don't think writing that symbol is any more difficult than ɹ or ʁ, and surely no more difficult than differentiating, in handwriting, r from ɾ, θ from ɵ, ɣ from ɤ, or ɫ from ɬ. Or is that just me? I know my handwriting has suffered since I became keyboard-dependent. Are you left-handed? I think I can see where that might make it more difficult. But I know left-handers with far better handwriting than mine (I'm related to one). I've noticed that Southern accents in general have a different sounding syllabic "r" than other North American accents. I think of this as one of the major features of those accents. Maybe it's just me though. I certainly couldn't explain the articulatory configuration that's responsible for the different sound, so I'm really no help. You have a pretty Upper Class New York City accent (that's how it sounds to me anyway). I can still tell you're from there by the way you say "Mary Harrison", "porridge", "mirror", "hurry" and some of your TRAP words. The word "idea" also sounds different. I say it with a FLEECE vowel followed by STRUT at the end, for a grand total of three syllables. The way you say it sounds more like a diphthong with a lax KIT onset and a schwa offset, i.e., it sounds like an RP speaker (maybe Wells) saying, "I dear". I don't know if that's because you're from New York. It's kind of subtle anyway though. I like the way you speak though, even though it's a bit different from the way I speak. That RP speaker would obviously have to stress the "dear" part of "I dear" though. I forgot to mention that (and yes it could be "deer" too of course). I thought the way RP speakers said "idea" was exactly the same as the way they say "I dear". Anyway, I don't think we need a special symbol for the "bunched r", and I think the IPA guidelines would be against it unless it can be shown to be phonemically distinct from /ɹ/ in some language - unlikely if they're not acoustically distinct. If I ever wanted to use separate characters for the two kinds, I'd use something like [ɹ] with the retraction diacritic or [ɚ] with the nonsyllabic diacritic for the bunched r.
As for writing the proposed symbol, it's easy to do in one stroke: start at the bottom left, curve up, come straight down, go straight back up, and then curve down to the right again. You do have to double back on yourself, but otherwise it's no problem. You misread my post. Go back and read what I said. First you wrote it "would be a beggar to handwrite" without explaining why. Then you wrote "the two-winged-r would be awkward to write becuase I doubt you could produce it clearly without lifting the pen from the paper (or marker from the whiteboard) at least once if not twice". And I said you can produce it without lifting the pen from the paper: curve up, straight down, straight up, curve down. I think that would be clear. "I've noticed that Southern accents in general have a different sounding syllabic "r" than other North American accents. I think of this as one of the major features of those accents. Maybe it's just me though. I certainly couldn't explain the articulatory configuration that's responsible for the different sound, so I'm really no help." Ditto. I've noticed a distinctive quality to the syllabic /r/ in some southern or midland speakers - I can imitate it, and in the past I tentatively identified it as retroflex, but I think I'm out of my depth at this advanced level of phonetics. I think the anon meant "without passing on the same line twice", otherwise you can write nearly any symbol with one stroke. But I think that's just of academic interest: I *could* write d with one stroke but I don't (I write the c and then the l both downwards), and I do sometimes write y with one stroke (passing on the upper right part twice). Anyway, I wouldn't find that symbol hard at all; but then, in physics we have to be able to distinguish all Greek and all Latin letters, even in italics, plus a bunch of other symbols; also, once upon a time I learnt to write hiragana and a few kanji. I had to try at least a dozen times to get anything sounding vaguely like an apical postalveolar approximant without curling the tip of my tongue upwards, and I finally managed to do that following Catford's instructions word by word. But I still find it extremely hard to do that between two vowels an a "normal" speed without sounding like a velar approximant or something. @Anonymous: I do think my New York City, or at any rate my Northeastern US roots are fairly obvious in my speech. I don't think I'd describe it as upper-class, but it isn't a broad accent of the kind most often associated with blue collar workers. Like most people, I code-switch according to circumstances, and there are definitely circumstances in which my accent broadens a bit. If some jerk almost runs me over, he's going to hear what I once heard a construction worker call "the Brooklyn comin' out in me." (I'm not from Brooklyn, but it applies just the same.) Less dramatic shifts occur with some members of my family and various neighbors. I'm not sure I could reproduce the subtlety of these shifts deliberately, but I always notice that my speech has changed when I hear it. @Tonio: You may not need a different symbol, but voice and speech teachers do, especially those who are interested in helping their students and clients to reproduce accurately differences in speech. A retracted diacritic under ɚ does not convey full, accurate information about the difference in articulation of the sound. John Maidment on his blog noted the lack of a symbol for a labial-postalveolar approximant for r in words like ruse, rude, roof, and suggested [w͡ɹ]. The subsequent discussion was about this implying a labial-postalveolar-velar approximant, i.e. a triple articulation. John agreed about the implication of triplicity, but seemed to think it undesirable. I don't really see why there shouldn't be some anticipatory labiovelarization in this allophone rather than just labialization. However I had already suggested [ɹ̫] with the old diacritic for labialization alone, avoiding I supposed any implication of velarity in [rʷ], though I have despaired of the mercurial way the IPA rejigs things like this. I think the arguments for using wynn for this bunched r are much better, and suggest it with no facetiouness at all. It even looks like a bunched r! It's not that I agree that this dos-à-dos John is talking about is difficult to write. But if it ever got adopted I think there would be a danger it would finish up getting written without the double downstroke and look a bit like an inverted ɣ, and there is enough confusion around that already. I think John Laver's psi would have been fine, but perhaps a bit _too_ arbitrary. But so, you might have thought, was yogh as a model for ezh. They have been differentiated of course, and so could any wynn-inspired symbol be in due course. Wynn has the virtue of being readily available, and there are precedents for using existing symbols from other alphabets that are of dubious appropriateness in traditional terms. Assigning codes in disordered speech ranges to new inventions which elicit various objections is not the way to go. @mallamb: [rʷ] works for me when indicating the labialized r I hear in Cockney, not a few other English accents, Brooklynese (a broad NYC metro area accent, regardless of borough), working-class Boston (where the w aspect sometimes crosses the line to v), and sundry other New England accents. Not sure I wouldn't need something different to show what one of my current clients (English) is doing. I admit [rʷ] doesn't clearly convey what is really going on. It's just convenient. - but I think Erik's symbol is better, and I stand firm in my admiration of it. I did say they could be better differentiated in due course. And the Anglo-Saxons seem to have managed all right with ƿ and p. They had more trouble with þ (thorn) and y by the time they were trying to write ye Olde Englisshe! Anyway, so does þ look like a p, and they managed all right with those too, and so do the modern Icelanders! And talking of Norsemen, [ɧ] looks like a Gothic h. And if the IPA had been worried about lookalikes I don't think it would ever have got started. Are not John's warnings about ɵ not θ, ɤ not ɣ still pounding, pounding in our ears? Their descendants had trouble over m, n, u (with u used for present-day v as well as u), leading them to spell cume, huney, luue with an o. Do you have a retracted plosive in /tr/ and /dr/clusters? If we really do need a new symbol for a bunched r, how about ɹ flipped about its vertical axis? It looks like an "r" symbol, and its pretty easy to right and shouldn't cause any headaches for font designers. No, 'pretty easy to right' is fine. Even if not for mirror-righters! I had been thinking along the same lines. The inverted ramshorn affair looks pretty overspecified to me. You'd think when I said just then that I had been thinking along the same lines I would have remembered I was going to propose Cyrillic ч as a stopgap, for the same reason as I proposed wynn: it's readily available. Plus its cursive form looks like a copperplate form of r.
At last, I can chime on this -- I've haven't had a chance to sit down with a mike or even an internet connection since this was posted. First of all, thank you, John, for picking up this subject and opening the debate. And thank you also for posting my suggested symbol as a possible one for this purpose. I'm honored. As for your request for sound files, here's one of me reading the same phrase twice, first with an apical-alveolar /r/ and then with a bunched or molar /r/. If I have time tomorrow I will search for examples of other speakers, but this might do for now. I believe that: 1. there is an audible difference between the two, if not an enormous one, and 2. I am not doing any secondary articulations along with the bunched /r/. As has been discussed, this is often found with some pharyngealization, but I don't believe that has to be the case. I welcome correction on this from sharper ears than mine, but I think all I've changed is the placement of the /r/, from apical-alveolar to "molar." An inverted-r would be fine by me, though I do think that my symbol (which we might call "the anchor," both for its resemblance to one and for the nautical/piratical associations) would be easier for students to keep separate from the turned-r. Another possible advantage is that the symbol could be modified to indicate the degree of bracing. A second rightward-stretching wing could be added at the mid-level of the symbol to indicate moderate bracing, and a third at the top to indicate pronounced bracing, a la Oklahoma, Texas, etc. This may be a bit fussy to write, but then one would only need to do so when one needed a lot of detail in the transcription -- that can get somewhat cluttered anyway. The basic symbol I don't find hard to write at all, whether on a blackboard or on paper. My students have been using it happily for two years, even though I tell them no one outsided of my class will ever know what they mean by it! The basic problem, as I see it, is that many Americans use this articulation both word-initially and post-vocalically. As things currently stand, we have to use two different symbols for this -- a turned-r for the first and a vowel with rhoticity for the second. This would seem to violate the basic principle of one action, one symbol. Plus, as has been mentioned, it bothers us American voice, speech & accent teachers to have to use a symbol that is so inaccurate. Erik, an invaluable exegesis from the horse's mouth. Are you saying inverted as opposed to John M's flipped? If so why? Wouldn't that look even more like ʟ than my ad-hoc existing symbols look like anything inappropriate? And the wings are going to inflate the coding requirements even more, whether they are diacritics or form extra symbols. Degrees of bracing seem more like the sort of thing to handle in definitions for specific dialects etc. As a native American Southerner, who uses the bunched/molar r naturally and natively, and as a burgeoning phonetician/phonologist, I do not hear a difference in the sound of your alveolar and bunched r's. It could be my computers speakers, or my headphones. It does look like a p, deal with it. I guess I should have said that the Southern r-colored vowel sounds different than how it sounds in other regions. @mallamb: You're a hoot. And of course, I did say that I preferred Erik's solution to my own. I had to look up sulcalized, by the way. Does this mean that sulky = groovy? Amy, we're two hoots, and that's how much we don't care what fools we make of ourselves. Well, first, I suppose I should admit to being the "Michael" that is mentioned in John's original posting. I think that the discussion here is great. I'm glad I finally got a chance to pop over to read it. The Southern "R" that is mentioned is definitely a molar-R. As I stated in the postings on VASTAvox, I certainly grew up making this R sound, which--I believe--for much of that state and Texas actually pulls further back than the molars. Honestly, I would venture to say that the bulk of speakers in the US naturally move toward this molar-R sound. Some of the areas where I hear the molar/pharyngeal R sound are through the upper midwest, California, the plains states, and--as we said--much of the South. Also, I would agree that almost every American uses this sound following the /k/ and /g/ phonemes. In my classes with actors, I teach them the variations between the phonemes here, indicating that many people use the tip of the tongue, many use a retroflex placement, and many use this molar sound. I do speak of the fact that there is no clear symbol for the final sound. I will say that--trying to give them something to use--I have taken to using the /ɰ/ symbol with diacritics for raising and retraction. When doing this, I explain that I am probably the only person they will find using this phonetic indication, but I want some way to communicate with them when I'm giving them notes. I will admit that I do encourage them to integrate the production of the /ɹ/ into their every day speech, however. I think that it aids in their being able to bring more linguistic detail to their speech and I think it actually helps them to obtain healthier vocal placement. Though much of the US comes close to making the consonant and the rhotic vowel much the same way, most of the country can make distinctions between the vowel and the consonant. However, the consonant retraction can often prevent a distinction if moving into the vowel (what would be [_.ɹə˞]. A prime example of this is our previous president's inability to pronounce the word "terror." He effectively made it a homonym with the word "tear." (I used to joke about our war on ripping paper). Depending on the amount of retraction into the pharynx or the height of the apex of rear of the tongue, one will hear variations to this sound, but these could be identified with diacritics around. Honestly, I don't care what the glyph is that we use for the sound, as long as we have one. I would be game for anything from the ones mentioned here to simply a reversed upper or lower case R. The IPA has certainly turned the e every way possible. They can't even seem to figure out which way the closed Epsilon should face--it is different on different revisions of the chart. So, rather than all of us giving proposals for a symbol, it seems we should figure out a way to request that the International Phonetic Association recognize a symbol for us. >Are you saying inverted as opposed to John M's flipped? If so why? Wouldn't that look even more like ʟ than my ad-hoc existing symbols look like anything inappropriate? >And the wings are going to inflate the coding requirements even more, whether they are diacritics or form extra symbols. Degrees of bracing seem more like the sort of thing to handle in definitions for specific dialects etc. Oh, it was mentioned that samples would be nice, I loaded a few to my server space. The first one is a speaker from Oklahoma. The second two are from Michigan. All three of these speakers make their consonant R sound is a molar/pharyngeal sound. The Oklahoma speaker, for the most part, makes is vowels with enough approximation to classify it as a consonant. The other two make some distinction between them. John, there's a very good reason why this illustration from DJ's "Outline" is difficult (in addition to the fact you thought it wasn't applicable to your own non-apical articulation). His sagittal cross-sections look plausible and physiological at first sight, but they are not based on X-ray images. For example, only the black part of the tongue is deemed to move, the grey area below it is rigid and identical throughout the whole book. This rigid grey area includes the tongue root and epiglottal region. This is the very opposite of what happens in real speech, where there is as much movement down here as there is in the upper part of the mouth. In your recent "Glottal opera" blogg, you commented on how agile this area really is in speech (or singing at least): "Marvel how the epiglottis swings back and forth, sometimes obscuring the view of the vocal folds". DJ's illustrations are subjective impressions illustrating a theory of articulation he advocated. Sometimes they work, sometimes they don't. This one did not work for you. X-rayed apical articulations show the tongue blade stretched, with the tongue body withdrawn into the pharynx (where it would also obscure the view in a laryngoscope). DJ's illustration shows the tangue blade and apex too cramped. By the way my own English r is non-apical too, I had to wait a further 40 numbered paragraphs before he got round to it. As a speech pathologist, I can contribute that we pick apart /r/. The consonant /r/ is always in the initial position of a word (foreign dialectal variations excluded here, for the sake of arugument). In the middle or end of words, the /r/ assimilates with the adjacent vowel(s) & is a unique sound in each environment (vocalic /r/, in our vocabulary). In working with apraxic kids (those who have a neurological impairment in motor planning), we have to isolate each example of how the /r/ occurs in a word: /er/, /or/, etc. If it's followed by another vowel (e.g. the word "barren"), it takes on a different life. Put another /r/ at the end of the word ("barer") and you have another set of variables. Add a triple whammy like "rarer" & you have a potential mess. I studied under Hilda Fisher at Northwestern in the mid-'70's & she had elaborate acoustic analyses of each of these. All different, but subtle. I fear these may have been lost in the intervening years, but I applaud the resurrection of the analysis. You were of course saying the same thing as John M. An inverted-lower-case "r" would be the same as taking the "turned-r" – the alveolar approximant symbol – and "flipping it on its vertical axis". I've been complaining about my eyesight over the past few days as an excuse for other misreadings. Just since having new lenses especially for the computer! "If we really do need a new symbol for a bunched r, how about ɹ flipped about its vertical axis?" I somehow managed to trace the anaphora right back to the r, missing the ɹ completely, as you can see from the fact that I went on "to propose Cyrillic ч as a stopgap, for the same reason as I proposed wynn: it's readily available. Plus its cursive form looks like a copperplate form of r."
I'd got fixated on that, and still prefer the r flipped about its vertical axis to the ɹ flipped likewise. Oh dear, it isn't in use already or something, is it? Erik, if you don't mind the similarity of John M's inverted-lower-case "r" to ʟ, what about another ready-made symbol: Cyrillic г? That has exactly the same relationship to the regular LC "r", and uncannily it too has a cursive form resembling a cursive "r"! But why on earth are we all picking holes in one another's suggestions when the most obvious ready-made stopgap is Cyrillic я? The IPA doesn't seem to have any objections to using symbols from other alphabets with various degrees of inappropriateness with respect to their origins. Some people use я for the epiglottal trill, though. Including me, but dementia has intervened. But as far as I know я hasn't been adopted and the symbols mostly adopted in the areas of Arabic I had dealings with were various vague look alikes for `ayin, and what I have followed up is still in the same state. But of course epiglottal trill я must be. Much more appropriate in phonetics, obviously. But it does prove the point that the IPA doesn't seem to have any objections to using symbols from other alphabets with various degrees of inappropriateness with respect to their origins. Looking at Pullum & Ladusaw's Phonetic Symbol Guide, the reversed small capital R, [я], was proposed for a voiced bilabial trill, but is not used to represent any sound. The turned small capital R is not used either. I suppose we could always turn, invert, or reverse the fish-hook, [ɾ], as well. Is there any specified procedure to appeal to the International Phonetic Association for a new symbol? The most recent appeal for a new symbol ([A] for the vowel midway between [a] and [ɑ]) was in the form of a short article in JIPA by Bill Barry and J Trouvain in 2008. I would suggest that those most interested in a new symbol who've posted here get together by email and put together a brief article and submit it to the JIPA editor (John Esling in UVic). For those of us working with disordered speech a symbol would be most helpful - I think John Maidment's suggestion a good one, but various options could be put into the article. I understand the IPA Council would make a decision on a new symbol assuming the JIPA article and subsequent discussion led to an agreed motion going to the council. This of course opens the debate as to whether IPA symbols should be denoting auditory percepts or articulatory gestures? Looking forward to something in print on this - I'd be happy to help co-author if needed, with some insights from clinical phonetics. Could someone else post some audio files? The ones that were posted are not working anymore. And what is the difference between a consonantal r and a syllabic r?